Hide painting is a traditional Plains Indian art form featuring geometric, battle and hunting exploits, "winter counts", and designs inspired by visions and dreams. 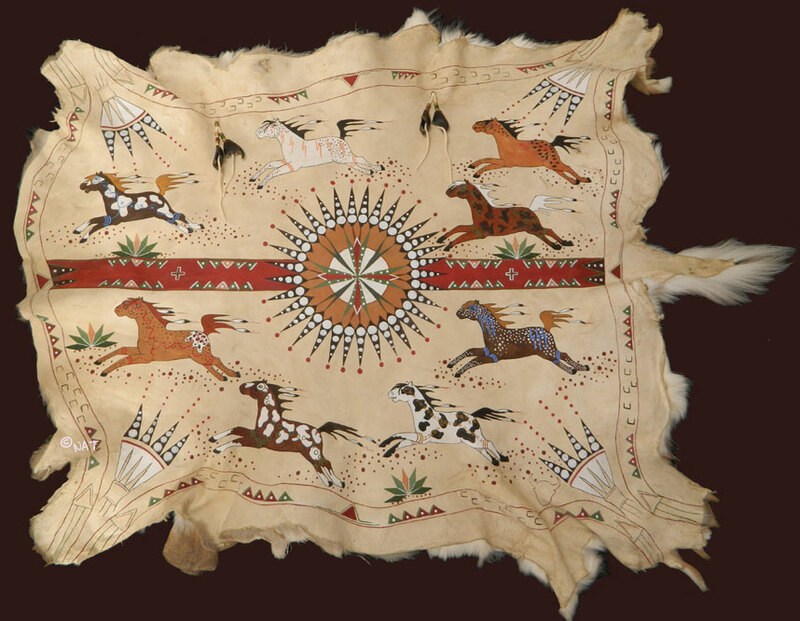 Although the painted deer skin robe below is of a more Southwestern origin and is also contemporary, we paint buffalo robes and other hides utilizing traditional imagery and designs - geometric's designs such as the "Feathered Sun", pictographs (buffalo hunts and battle scenes), "winter counts" as seen in museums or as an individual art piece as the example below. When painting traditional buffalo robes and hides we use earth pigment paints. On some occasions, we use acrylic paints as seen below.